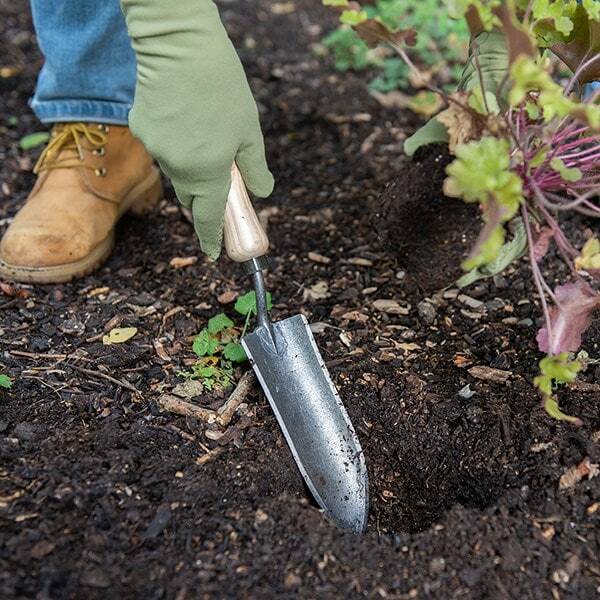 Buy De Wit transplant trowel: <ul><strong><li>Strong tempered steel</li><li>Perfect for tighter spaces</li><li>Lifetime guarantee</li></strong></ul><br>With a narrower blade than a standard trowel, this streamlined trowel is designed for transplanting plants and seedlings, but equally useful for digging up tap-rooted weeds, planting bulbs and general cultivation.<br><br>Constructed from robust tempered steel, it won’t bend with regular use, and the sharpened blade gives it superior soil penetration to make single-handed digging easy.<br><br>The perfect tool for working in smaller spaces, it's ideal for planting up pots, containers and baskets, and weeding densely planted beds and borders.<br><br>Measurements:<br>Head L17.5cm x W5.5cm (7” x 2.25”)<br>Total length 34cm (13.5”)<br><br><strong>About De Wit tools</strong><br><br>The Dutch are renowned for making the world’s finest garden tools, and De Wit is the most respected name of all. Founded in 1898, the family-owned toolmaker combines old-fashioned quality and craftsmanship with innovative design to create superior tools that last a lifetime.<br><br>Every tool is hand-forged in the Netherlands from tough boron steel - shaped, sharpened and burnished for durability, giving it the same blackened patina as traditional Edwardian tools. Each is fitted with an FSC-certified solid ash handle for ultimate strength and shock resistance, oiled to provide first-class protection against the elements.<br><br>All De Wit tools come with a lifetime guarantee against manufacturing defects, making them a truly once in a lifetime purchase. With a narrower blade than a standard trowel, this streamlined trowel is designed for transplanting plants and seedlings, but equally useful for digging up tap-rooted weeds, planting bulbs and general cultivation. Constructed from robust tempered steel, it won’t bend with regular use, and the sharpened blade gives it superior soil penetration to make single-handed digging easy. The perfect tool for working in smaller spaces, it's ideal for planting up pots, containers and baskets, and weeding densely planted beds and borders. This narrow trowel is ideal for removing deep-rooted weeds from a rockery or border. It is very comfortable for my small hands and reassuringly sturdy. I expect it to last a long time and continue to be very useful. Really useful. Used it lots. It's a quality product and good buy. I use it to transplant seedlings, make holes for bedding plants in the heavy clay soil at my allotment. I like De Wit products and this trowel is great for transplanting in small spaces. 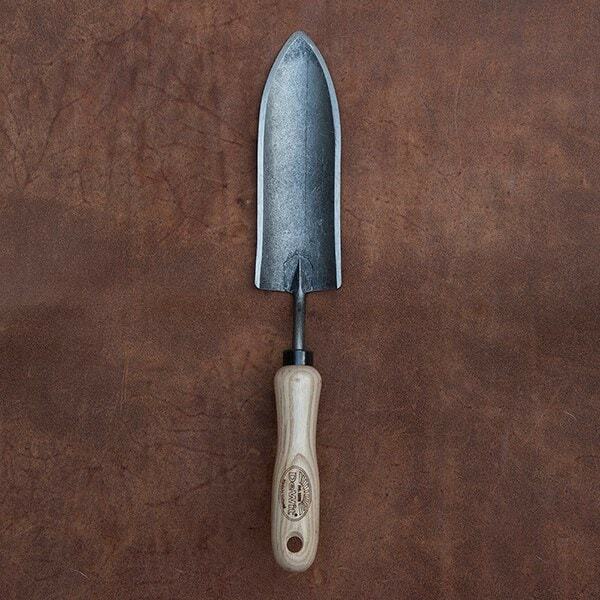 The trowel is narrower than other trowels and doesn't disturb the plants nearby when digging around. I have found that this narrow trowel with very sharp edges is actually more useful than my regular trowel. Excellent for getting plants out of the soil prior to moving them as it goes down and deep and preserves the root ball. And a must-have for large bulbs like daffs. Makes a neat cylindrical hole that the bulb drops into. Thanks for getting back to me. I've been thinking hard about this. I thought about going for:- a) Mini Raised Bed, support frame and Liner. I thought this would be good as it will offer some protection from the elements as well as the weather. My patio is east facing so really only gets direct sun in the morning.... Assume that this will be the equivalent of 1 large window box. b) then thought I'd go for the vegetable planting bag with willow surround. I would get 2 of these, as these would be the equivalent of 2 large window boxes. If I buy these do I need to get anything to protect from pests - a cover of some sort - if so what would you recommend? I know I do have a problem with snails and slugs already c) finally what compost would I buy? Sorry to bug you with more questions. Just want to make sure I get the right stuff.